Brazilian diamonds were discovered around 1725 by gold miners along the banks of the Rio Jequitinhonha, in the state of Minas Gerais. For more than a hundred years, the country was the world’s most important diamond source, as the famous Golconda deposit in India was nearly exhausted and South African mines were yet to be discovered. Diamond mining in Brazil continues today, though largely overshadowed by the output of other countries. But despite sporadic production, important stones continue to emerge from Brazil. The country has long fascinated me. Following many visits to colored gemstone deposits there, I took an August 2012 trip to Minas Gerais—Portuguese for “general mines.” What I saw led me to believe that the future of Brazilian diamond mining looks promising. Brazil has several alluvial diamond sources, where stones are mined from the sands and gravels of river banks. There are also some potentially important diamond pipes that may warrant larger-scale open-pit or underground mining. Diamonds are mined in several Brazilian states, including Mato Grosso do Sul, Bahia, and Rondônia. I visited an alluvial diamond mine in Minas Gerais, which is famous for its gold and colored gemstones, as well as other commercial minerals. Owned by GAR Minerals, the mine is located near the diamond-bearing Abaeté River and the town of Três Marias. GAR Minerals has six properties along the Abaeté River and six others near the town of Coromandel on the Santo Ignacio River, also in Minas Gerais. Each property is around 2 hectares—nearly five acres—and licensed for diamond exploration. Coromandel is known for large stones with high clarity that are brown or colorless to near-colorless. The brown stones can be turned colorless by a high-pressure, high-temperature (HPHT) enhancement process. The GAR mines along the Abaeté River mostly contain smaller diamonds, but they have produced some large top-quality pinks. Important stones GAR has mined in Coromandel include a 263 ct rough diamond that yielded two 70 ct pear shapes, both H color. Coromandel also produced a 140 ct rough that yielded a 10 ct E-color and a 56 ct H-color diamond, both with high clarity. Although the Abaeté River is the better-known source for pink diamonds, Coromandel has also produced some specimens, including a 21 ct Fancy Intense pink rough crystal. At the Abaeté River, GAR has recovered a 26 ct crystal that yielded a 12.60 ct Fancy Intense purplish pink cushion shape. The company also found a 7 ct rough diamond that produced a 4.24 ct Vivid pink. Colorless stones from these mines weigh 10 ct or less. It is believed that the Abaeté River has supplied some of the most important pink to red diamonds to come on the market in the last 50 years. The entire length of the river, where GAR Minerals’ properties stretch approximately 40 km along the bank, has considerable diamond potential. GAR is a fourth-generation family-owned business. Company officials anticipate their Abaeté River properties will remain productive for at least another two generations. I visited a GAR mine near the Abaeté on a working farm owned by the family. Getting there from the town of Três Marias required driving on a dirt road and then crossing a swaying suspension bridge on foot. Like other GAR properties, it is an alluvial deposit with diamond-bearing gravel. 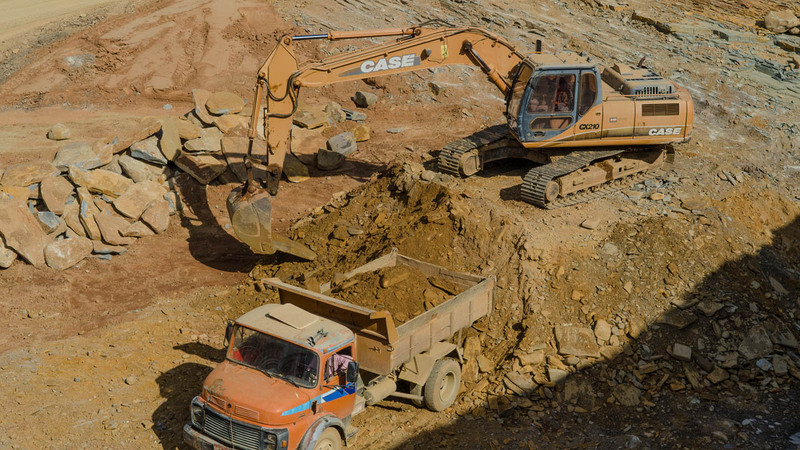 This entails small open-pit operations in which excavators remove the gravel all the way down to bedrock and load it into trucks for careful examination. Because diamonds are denser than most other materials in the gravel, depressions indicate where valuable concentrations might be found. Once an area is mined down to the bedrock, operations continue by following the alluvial gravel along the riverbed. Trucks then haul the diamond-bearing gravel to a processing (or washing) plant, where diamonds are separated from the gravels and other minerals, often referred to as overburden. The processing plant uses a feeder to bring the gravel into an automated system. There it is washed with a water cannon before separation. A vibrating screen then removes coarse material, and sluices transport the remaining gravel to a worker who washes it by hand while a sorter sifts through the material looking for the occasional diamond. 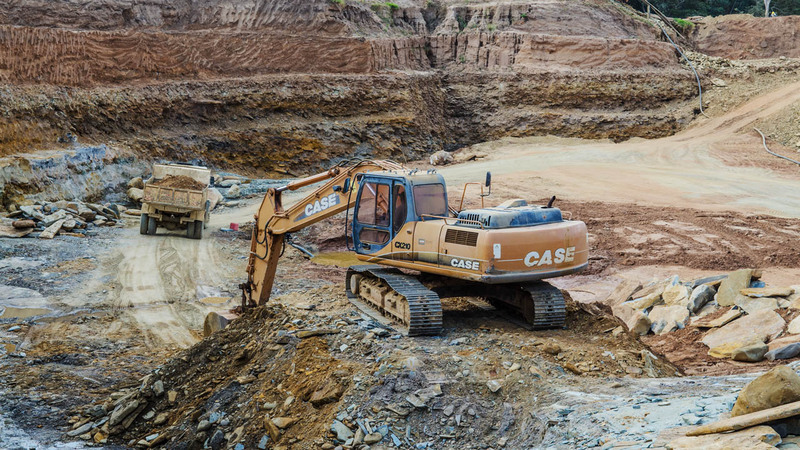 In an effort to restore areas damaged by open-pit mining, GAR has implemented a formal plan to refill the pits, while following guidelines set forth by an environmental impact study. Andy Lucas is manager of field gemology at GIA in Carlsbad, California.